Professors from such prestigious global universities as Princeton University, the University of Pennsylvania, and the University of Cambridge, and high-level UN officials will give lectures. The “Global Collaborative Summer Program (GC)” is hosted annually by Kyung Hee University; the four-week program begins on Monday, July 2nd. 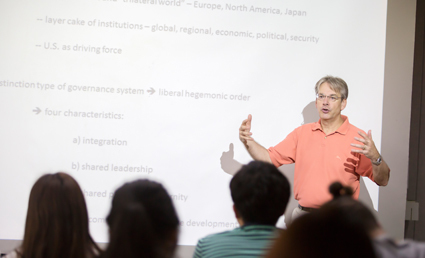 Since 2006, Kyung Hee has been hosting the annual GC program in the summer, where world renowned scholars and practitioners are invited to lecture. With the goal of building a better future, global agendas are addressed though this world-class enrichment education program. Especially, participating high-ranking UN officials provide lectures on international organizations based on real-life experience. 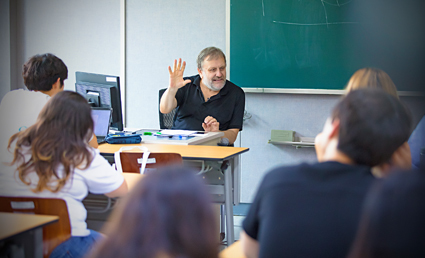 The lineup of professors include John Ikenberry (Princeton University), Ram Cnaan (University of Pennsylvania), Slavoj Zizek (University of Ljubljana), Ha-seok Jang (University of Cambridge), and Gregg Lambert (Syracuse University). They are also Eminent Scholars of Kyung Hee. High-level officials of international organizations will also take to the rostrum. Ramu Damodaran, Chief of UN Academic Impact (UNAI), and Cyril Ritchie, President of Conference of NGOs in Consultative Relationship with the United Nations (CoNGO), are slated to take part. Professor Zizek will offer sharp analysis on capitalism and politics, while Professor Ikenberry will do so on the topic of international relations and politics. Because the two professors have been active in proposing possible solutions for issues concerning international politics and the Korean peninsula, it is hoped that they will share a variety of perspectives regarding international affairs and the North Korean nuclear issue. Professor Ha-seok Jang plans to lecture on the system of reasoning that helps to enhance problem solving skills, based on a philosophy of science process that poses fundamental questions about the essence of scientific knowledge. In addition to the lectures offered by world-class academics and professionals, GC also organizes student participation programs. By providing opportunities to gain on-site, work-focused experience and cultural involvement, the goal is to increase student interest regarding global challenges, and to encourage them to partake in creating a better future. To those who are interested, internships are offered at local businesses and NGOs.